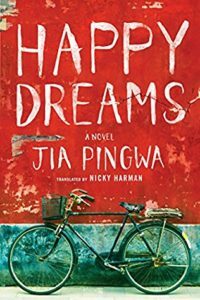 I recently received a copy of Happy Dreams by Jia Pingwa to review for the Washington Independent Review of Books. I liked the book a lot and enjoyed writing the review, which you can read here. When the book arrived, I was excited to read the jacket bio of the author, which said he had graduated from Northwestern University’s Chinese department in 1975. I also graduated from Northwestern in 1975, although from the Philosophy department, so I wondered if our paths had crossed when we were undergraduates many years ago. I did some further research into the author and learned the truth: Jia graduated from Northwest University in Xi’an China, NOT Northwestern University in Evanston, Illinois. Translation is a funny thing, because there doesn’t seem to be a way to distinguish between Northwest and Northwestern in Chinese. The word “northwest” is written xi’bei (西北), which literally means West North, so the University in Xi’an is Xi’bei DaXue (西北大学). I don’t know much about the school, but I do know that is not where I studied for four wonderful years. I do wish I’d studied Chinese back then, though, because it would have made things easier when I began learning the language in Singapore a decade or so later. The jacket bio isn’t wrong, exactly, because the words are the same in Chinese, but I made an effort to tell the publisher and the translator that the bio was misleading to an American readership. I got no response from either, though, and it wasn’t something that belonged in a review of the book. Now that the review has been published, however, I wanted to set the record straight! Faux amis can be found everywhere! Speaking of true ones, we just had a nice visit M. C. Rydel. I accompanied him to an open-mike event in lower Manhattan. I’ll send you a link to some photos under separate cover. Congratulations on the book contract!